Leaf retention: Evergreen but dies to the ground in hard freezes. 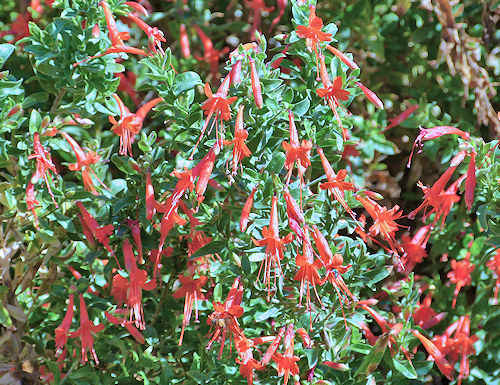 Flowers: Red, reddish-orange, pink, or white, up to 2.5" long, in clusters. Bloom: Mid spring to late fall. Fruit: A narrow, cylindrical capsule containing seeds with fine hairs that aid in wind dispersal. Leaves: Narrow, 1" long, light green. Stems: No thorns. Arching or upright. Roots: This plant spreads by rhizomes and is slightly invasive. 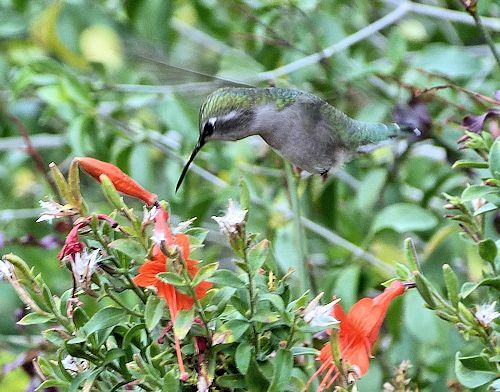 Wildlife: It attracts hummingbirds and butterflies. It is browsed by rabbits if watered during drought. Enclose within 18" high rabbit-proof fencing. Origin: New Mexico to California and Mexico. Soil: Well drained, dry, pH 6.6-7.5 (neutral). First Year Care: Water lightly to moderately every day to establish an extensive root system, reducing water as time passes. Leaves turning yellow or brown can indicate over- or under-watering. After the first heavy rain of late spring or summer, lessen water to see if the plant will take off on its own. Prune: Cut 4" high in winter. Propagation: Seed or root division. This plant self-seeds easily. Uses: Ornamental, hummingbird garden, erosion control on slopes. This plant is a member of the Evening Primrose family (Onagraceae). 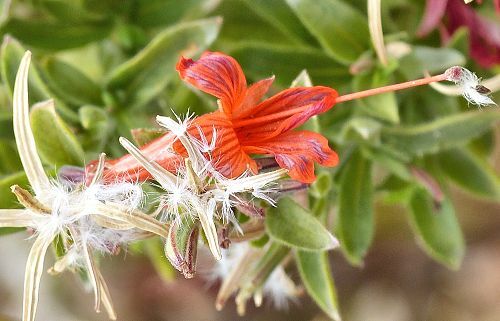 Its former scientific name is Zauschneria californica. 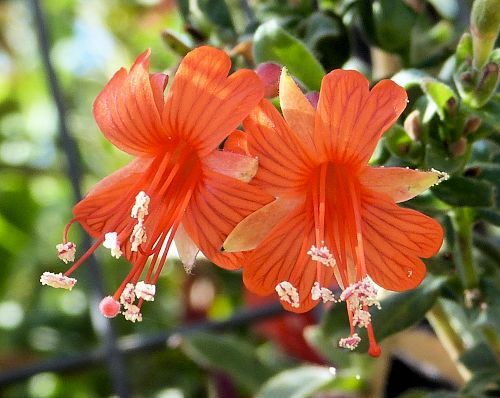 Other common names are California Fuschia and Hummingbird Flower. It is highly variable in appearance and a number of cultivars have been developed. 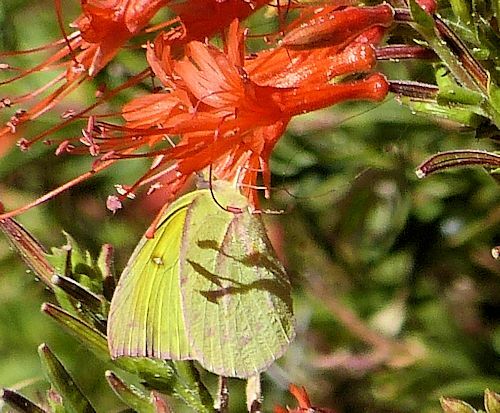 The butterfly in the picture is a Cloudless Sulphur.